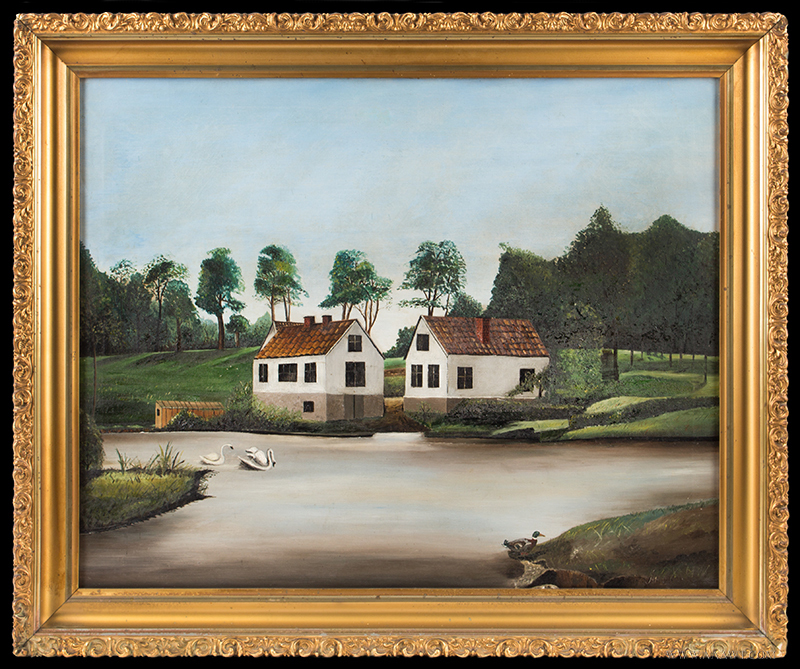 Painterly depiction of a cottage by a river, from the perspective of the opposite shore. 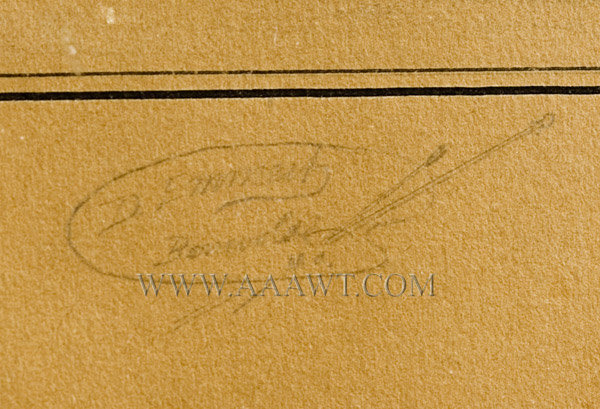 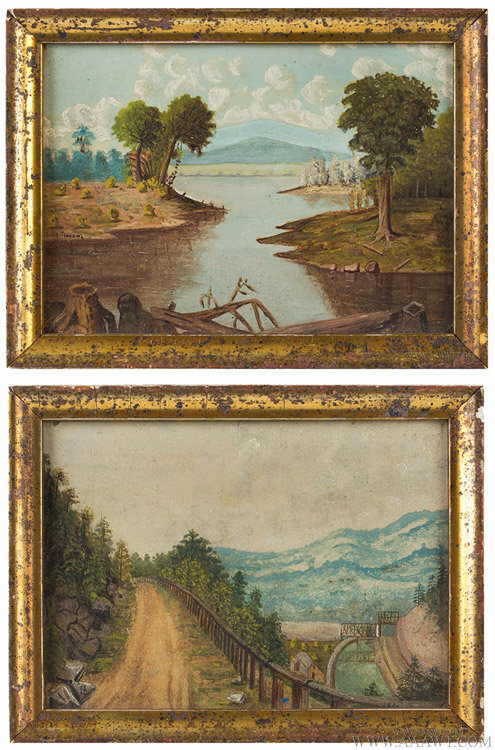 Smillie would sometimes write the location of his landscapes following his signature, and the inscription [N.Y.] follows with the title Westchester Marshes. 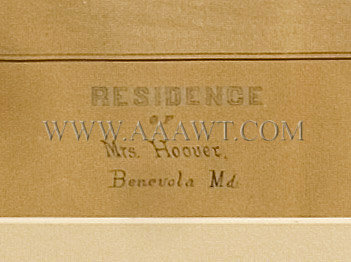 The title, artist’s name, and partial address [650 Madison St] is written on a label affixed to the rear surface of the stretcher. 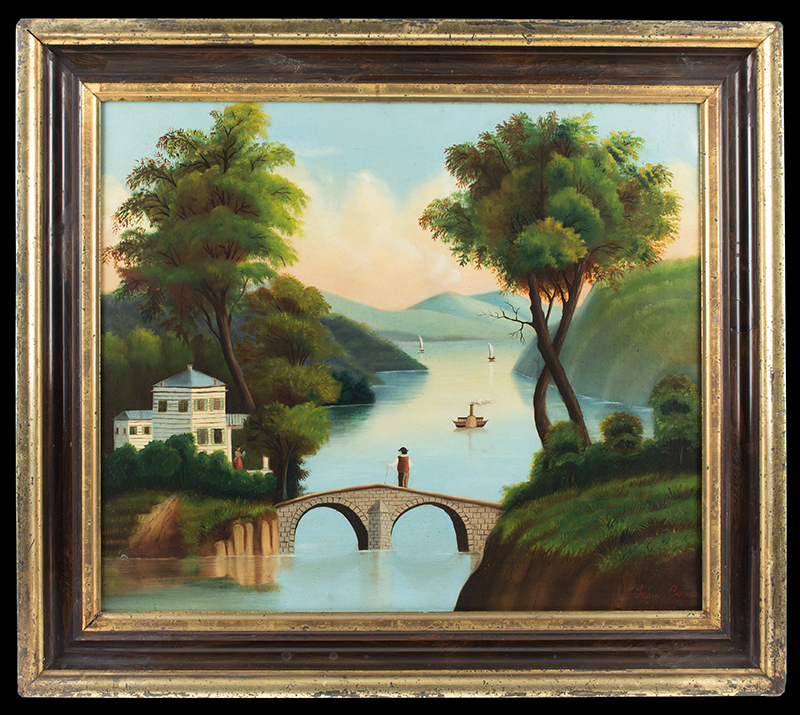 The painting displays lovely shades of blue and green, a wonderful palate; the work features a building, a woman in red dress; man walking across bridge, a paddle wheeler and sailboats. 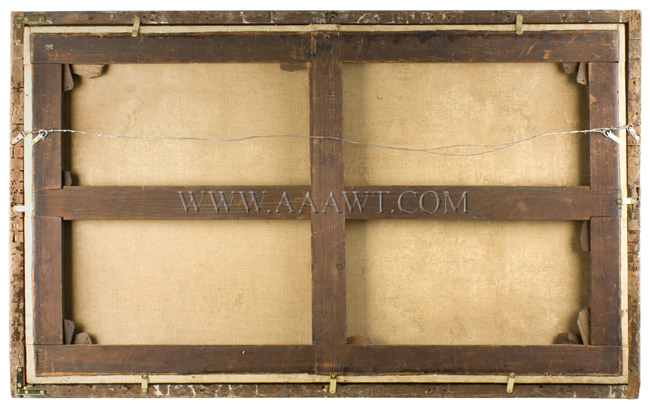 Overall great condition. 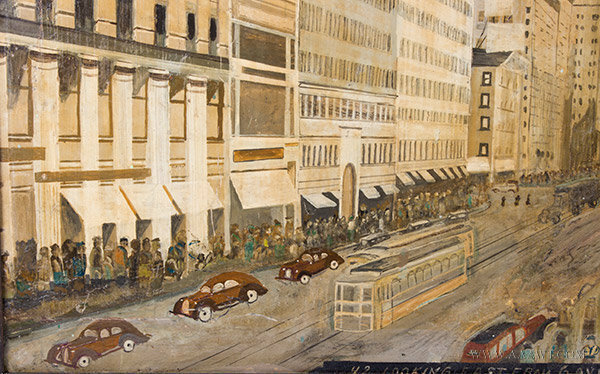 Wilhelm Meyerheim was born in Danzig, Germany (now Gdansk, Poland); eventually settling in Berlin, working there until his death. 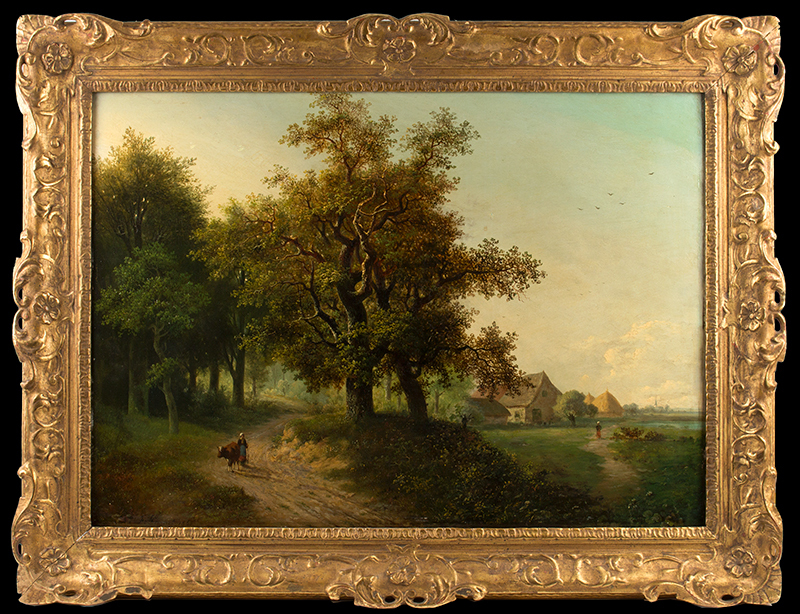 His father, a talented portrait painter, provided him with his early training before he studied in Danzig, eventually continuing his education at the Academy in Berlin. 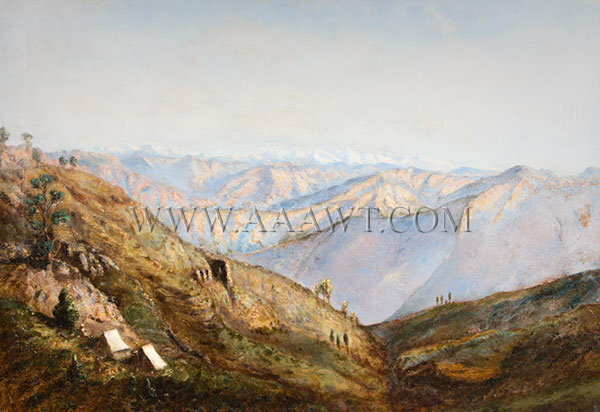 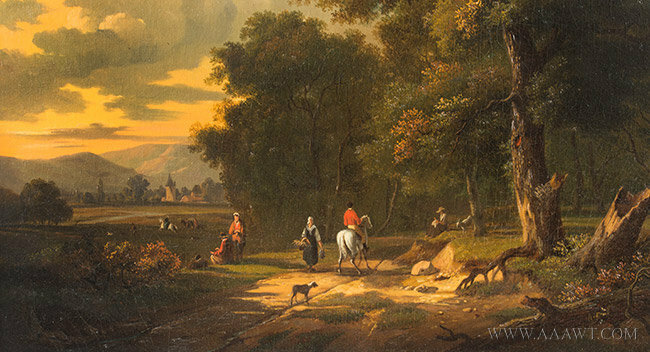 His works suggest that he spent time sketching the peasantry in the countryside's of Hesse and Tyrol. 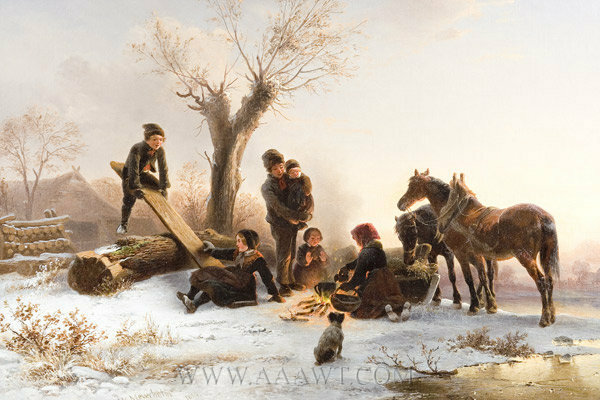 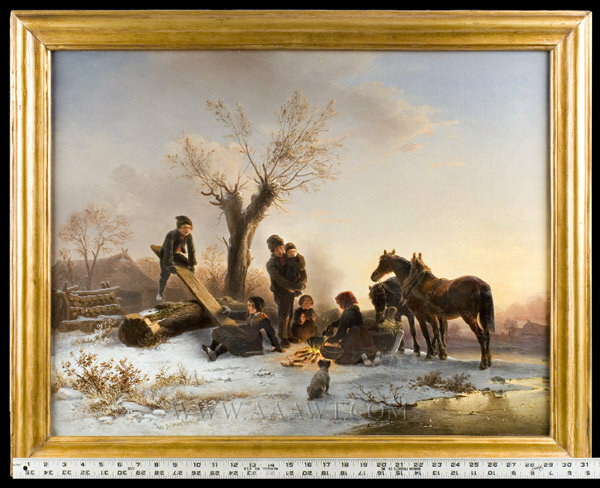 The artist soon became popular painter - creating scenes of everyday outdoor life, simple activities which often included his favorite subject's, children and horses; winter scenes, often with the same old tree as depicted herein-silhouetted against the winter sky. 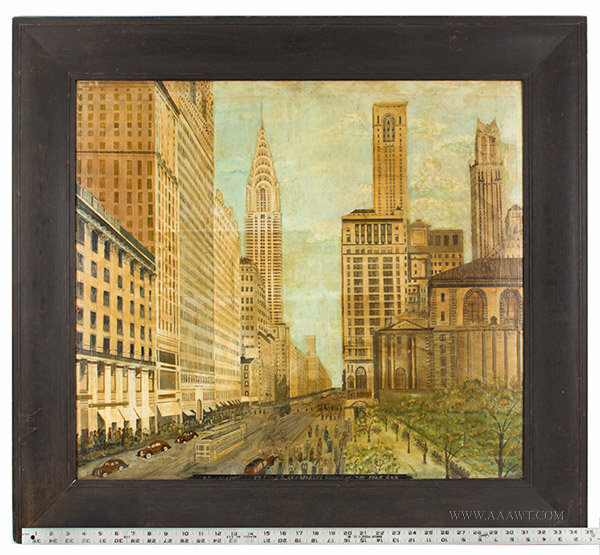 The work has be lined and stretched on a modern strainer and is mounted within a period frame. 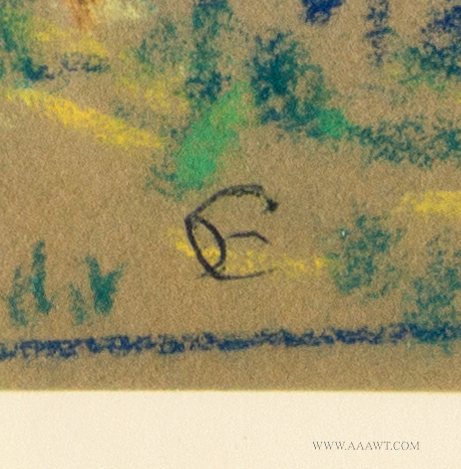 Extremely minor fill mostly confined to outermost edges. 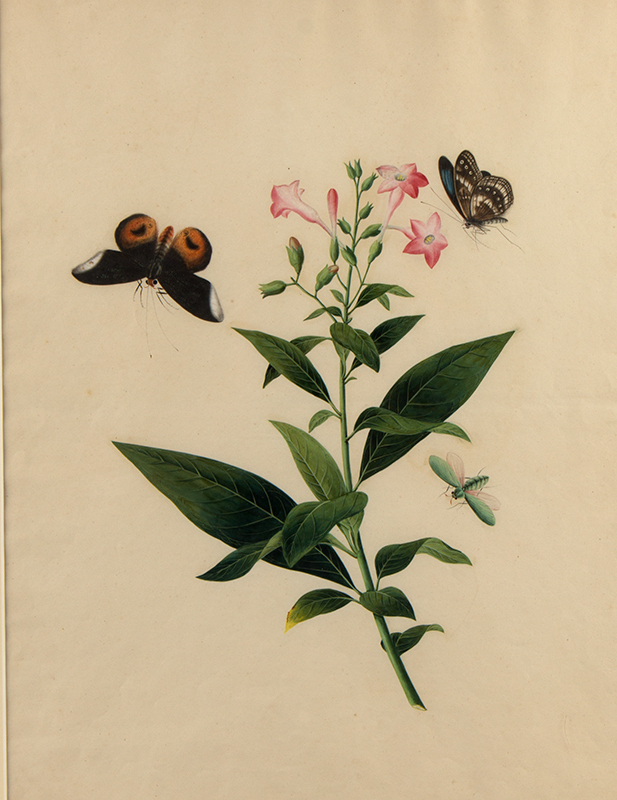 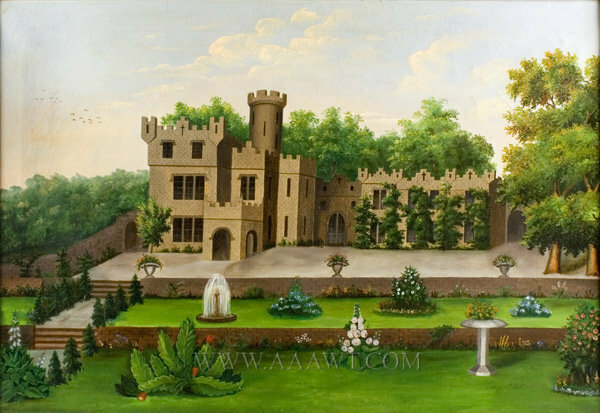 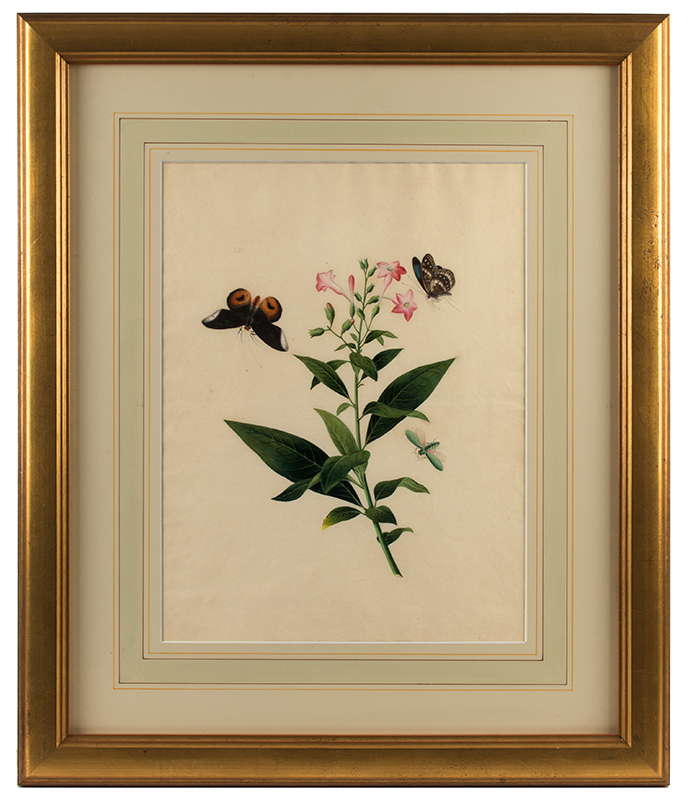 Dimensions: 25.5 by 31.75: framed; 21 by 27.5" sight-size. 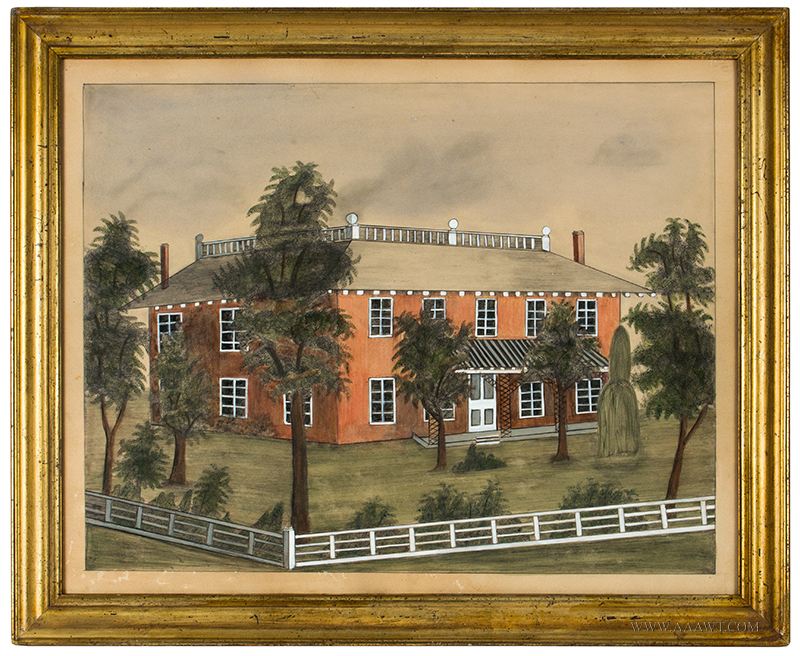 A house portrait, "The Residence of Mrs. Hoover, Benevola, Maryland", a blue Federal home having a white picket fence and outbuildings with family and carriage in the foreground, signed indistinctly on the lower right. 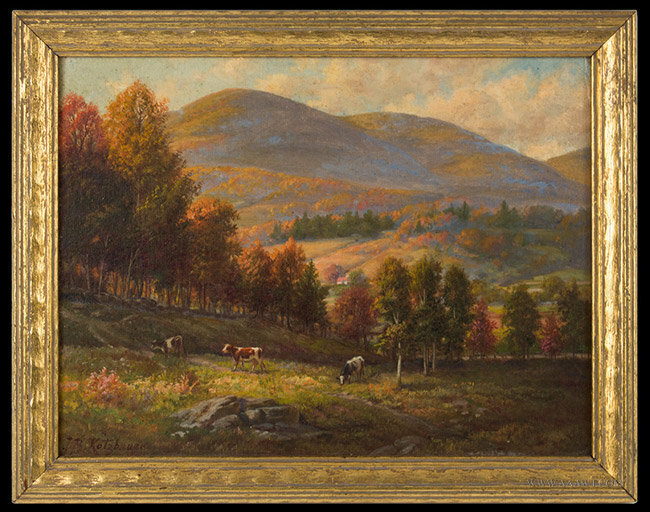 Daniel Grose was born in England; he lived in Canada during the 1860s and in Washington DC in the 1870s and 1880s. 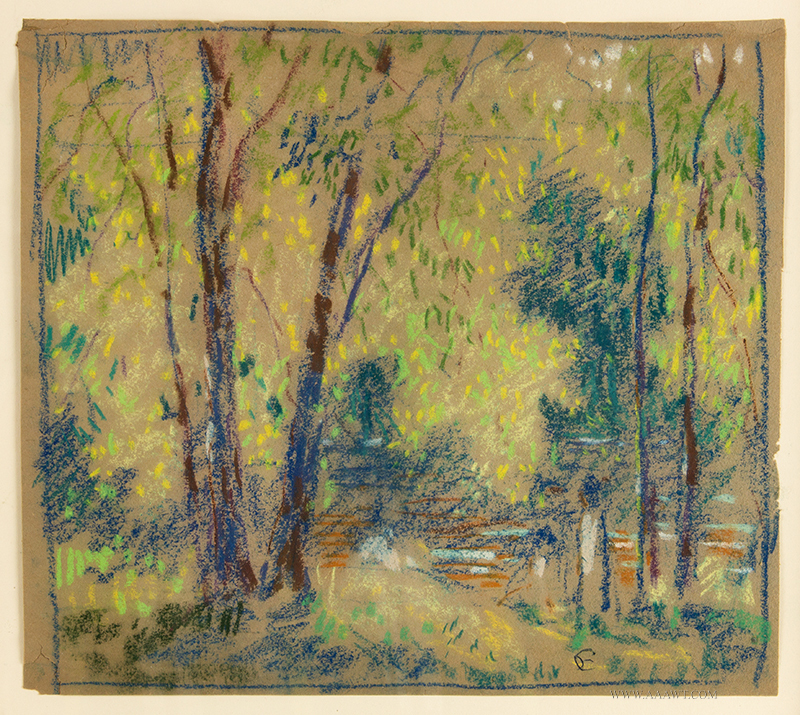 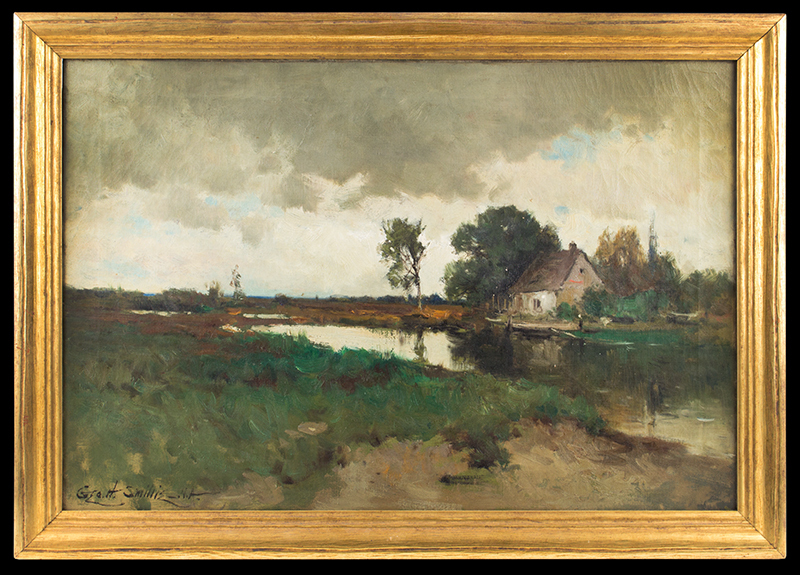 His uncle was the well-known English landscape painter Francis Grose; it is assumed that Daniel settled in Canada whereas so many of his romantic landscapes are in Canadian museum collections. 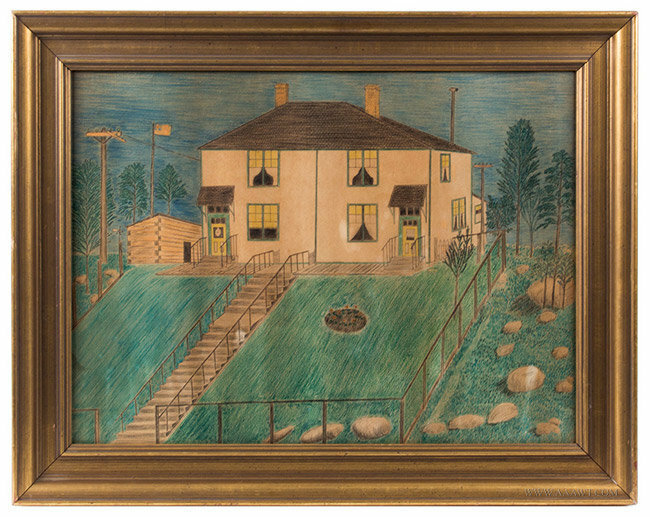 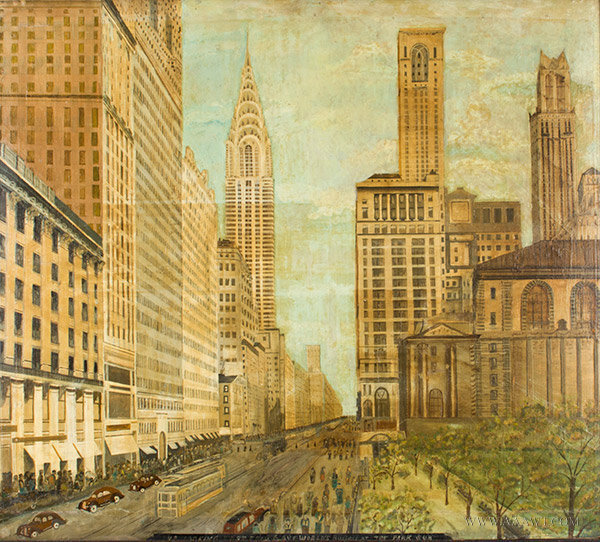 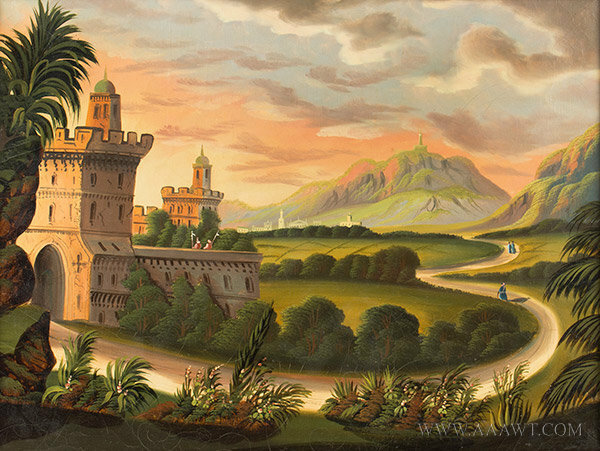 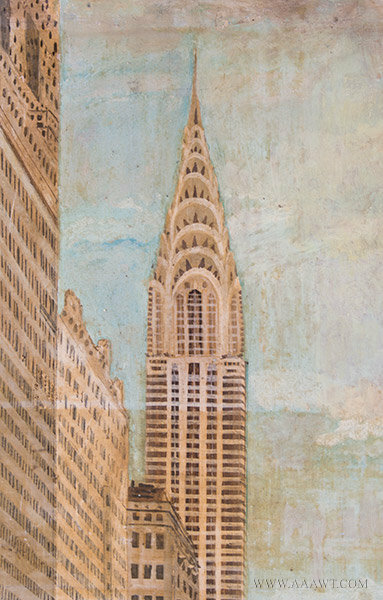 The painting remains in fine original condition and is mounted on original stretcher; frame is original and has old and minor restoration and/or imperfections. 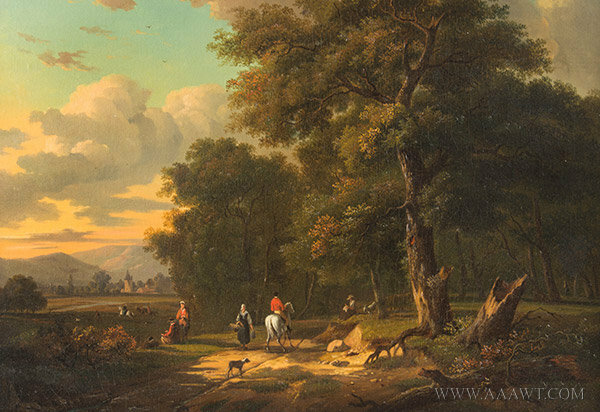 A tidy farm environ, the farmer driving his hay wagon pulled by a team of horses; a dog and his companion stroll towards the brook. 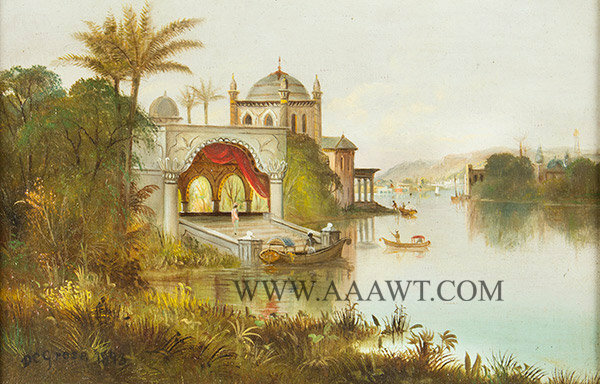 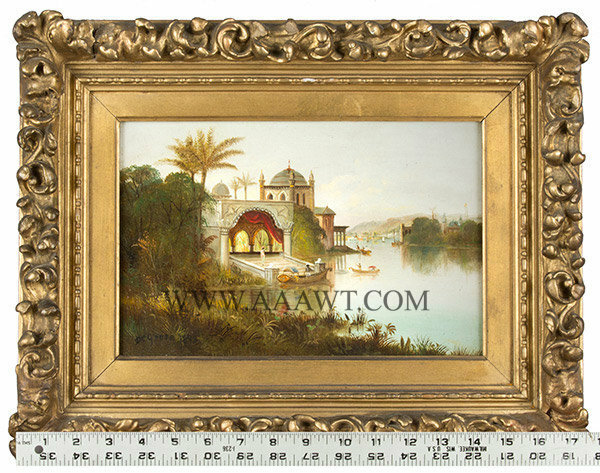 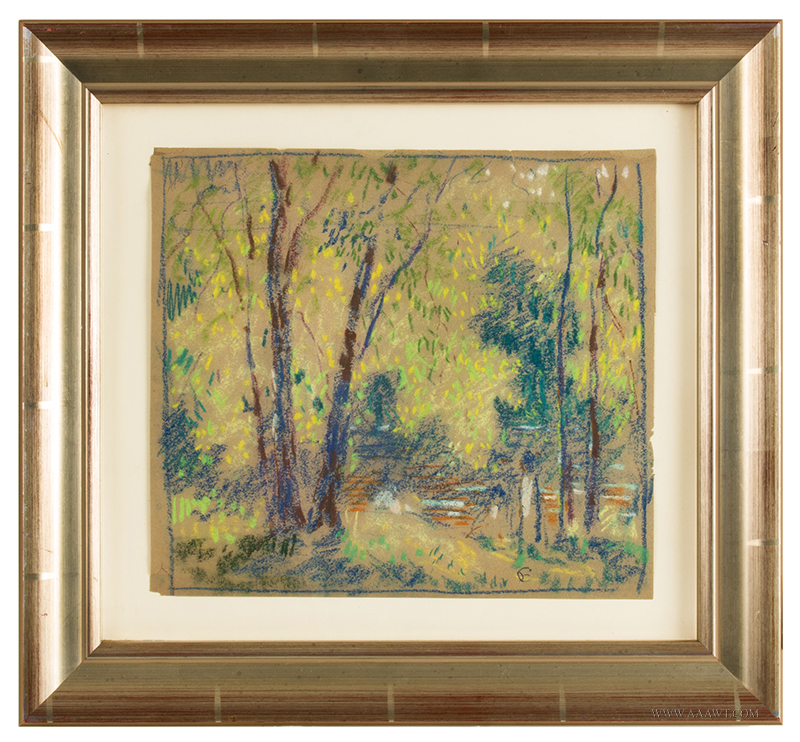 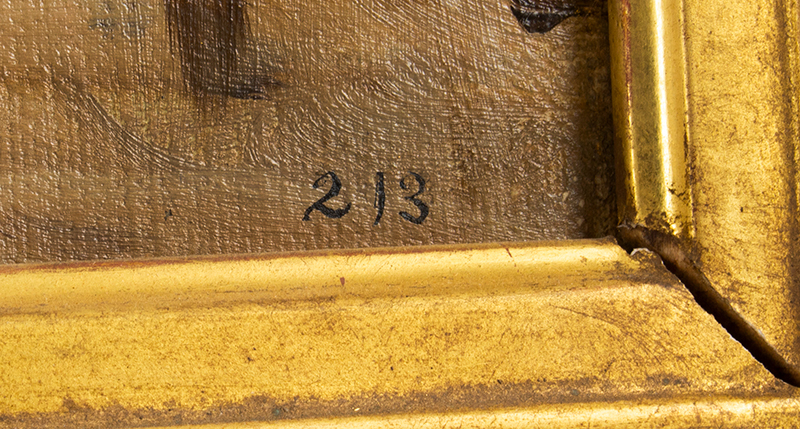 The works are mounted within carved and gessoed gilt frames; excellent condition, save for water stain on one mat. 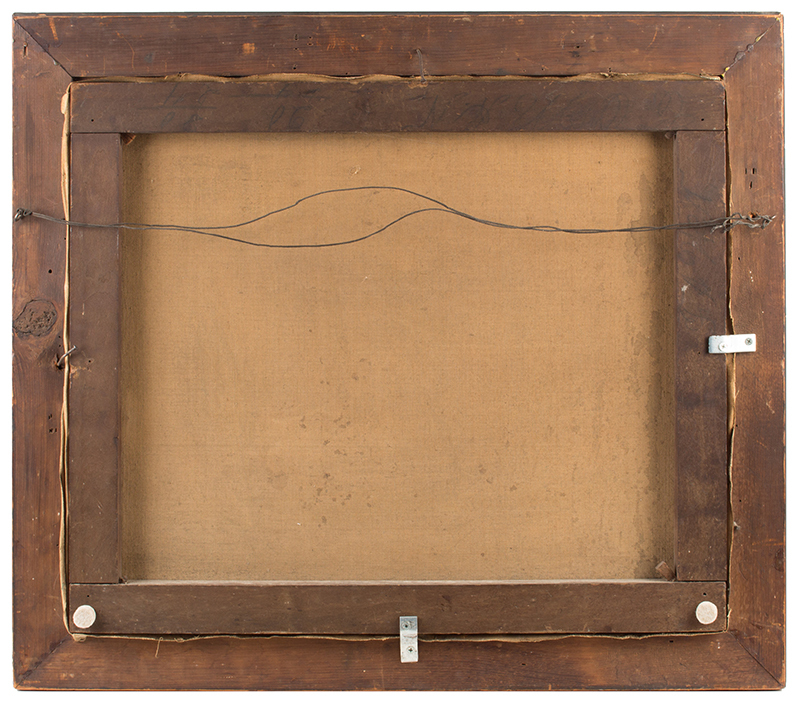 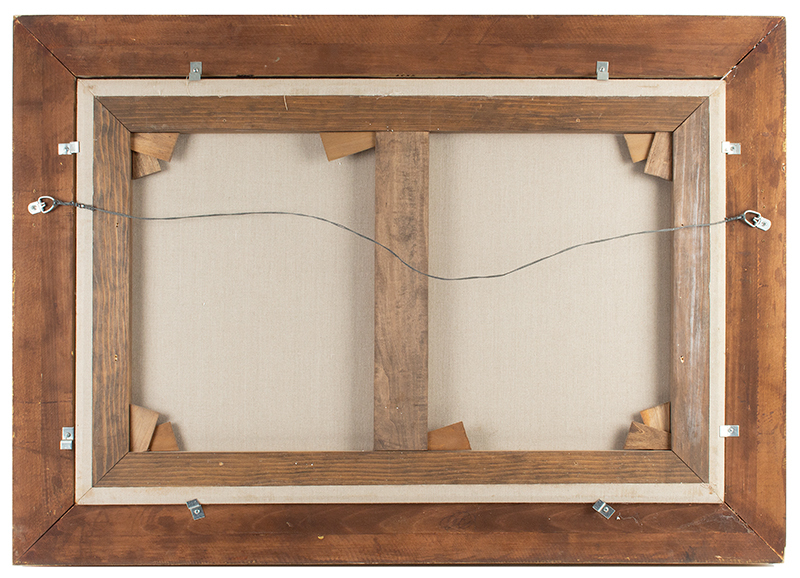 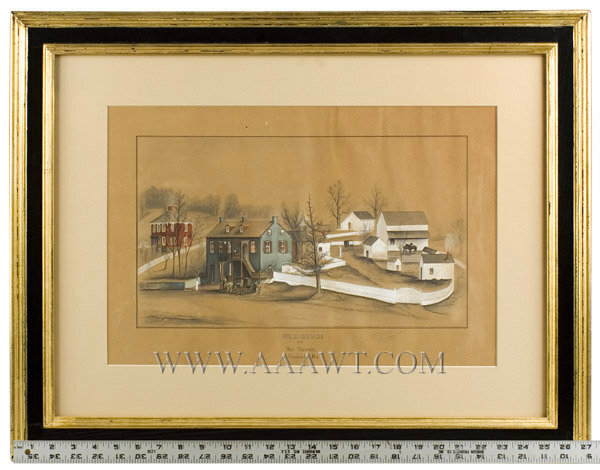 The frame measures 28 by 22-inches, while the view area measures 22.5 by 16.5-inches. 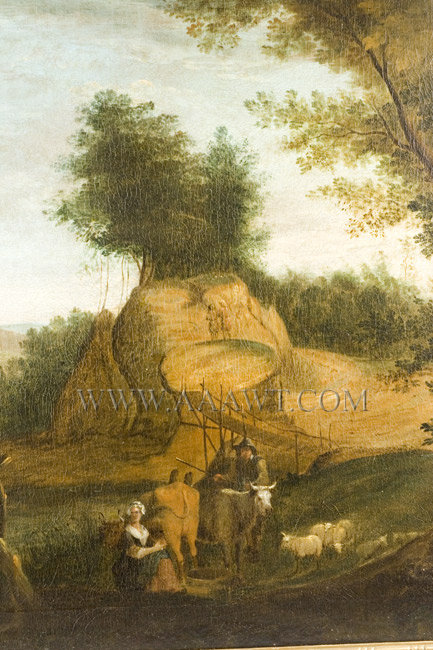 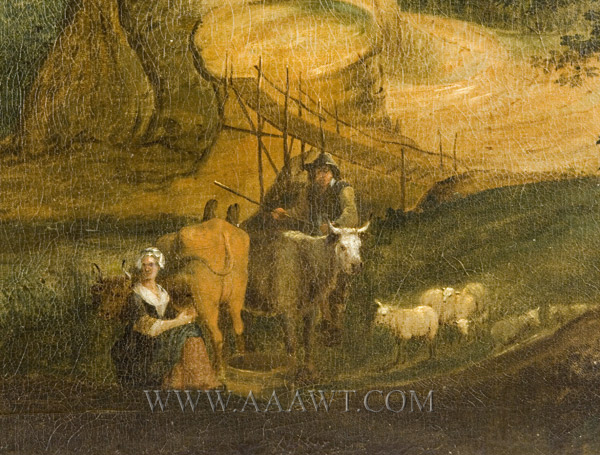 As depicted, old woman with burden of firewood, homestead; village and mountains in background. 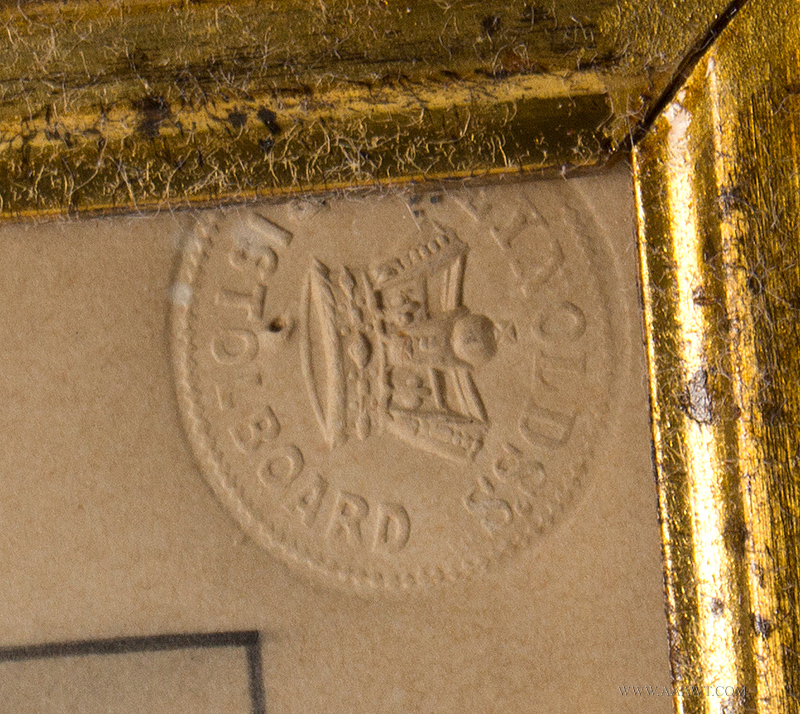 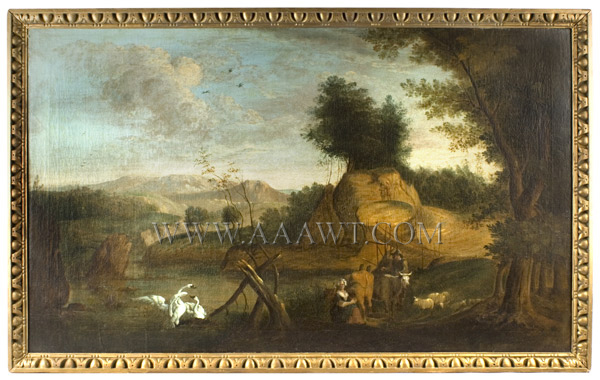 The work is mounted within original gilt frame and remains on original stretcher, all else fine. 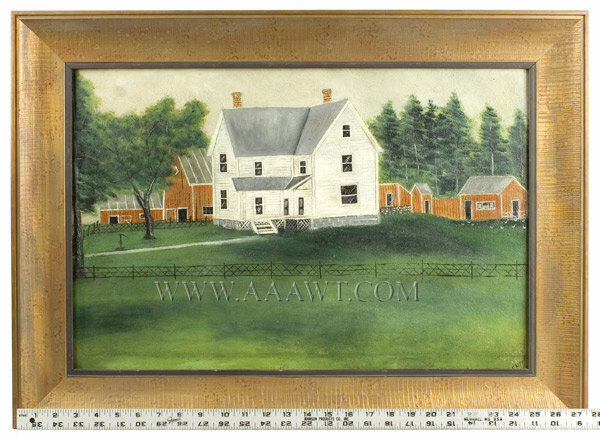 Dimensions: 22.5 by 19.5-inch frame, 18.5 by 15.5-inch sight-size. 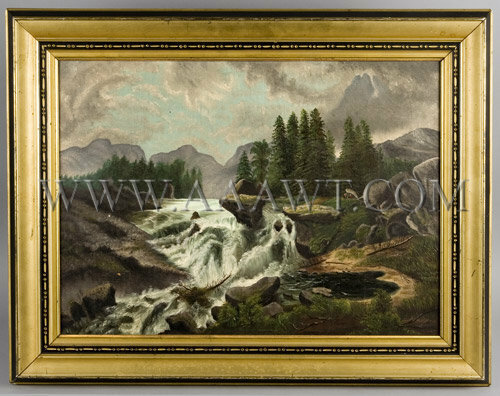 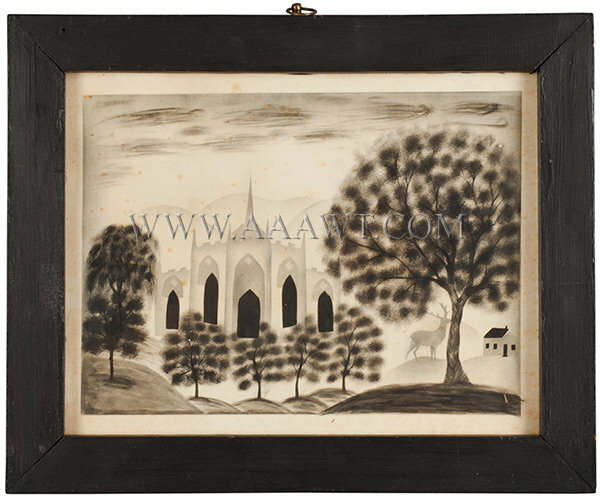 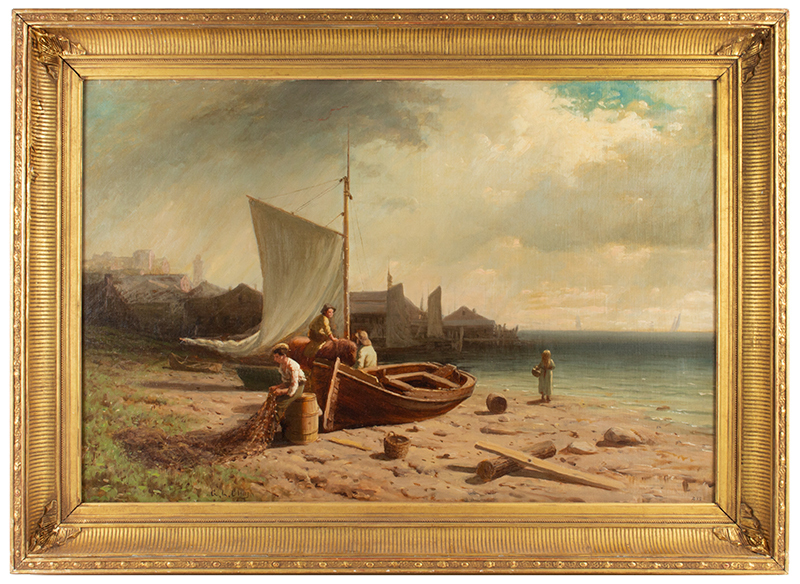 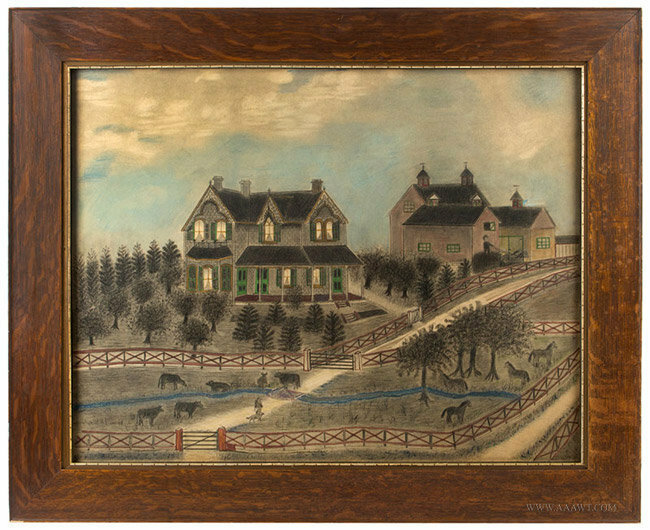 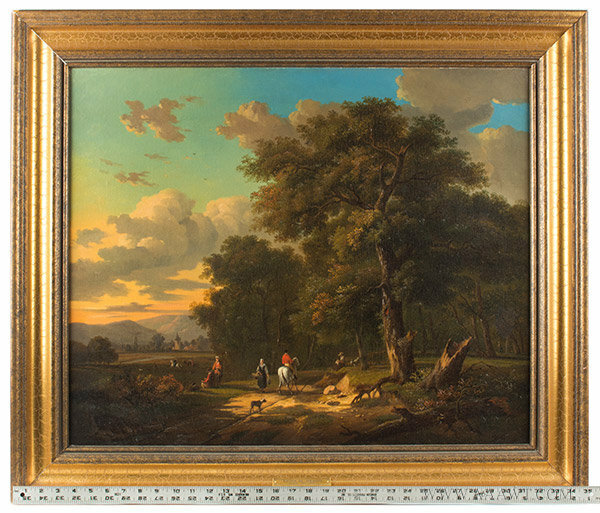 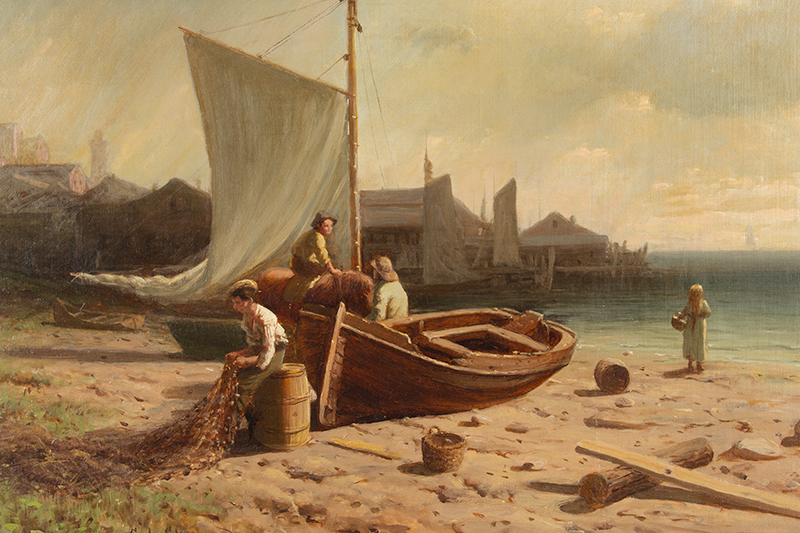 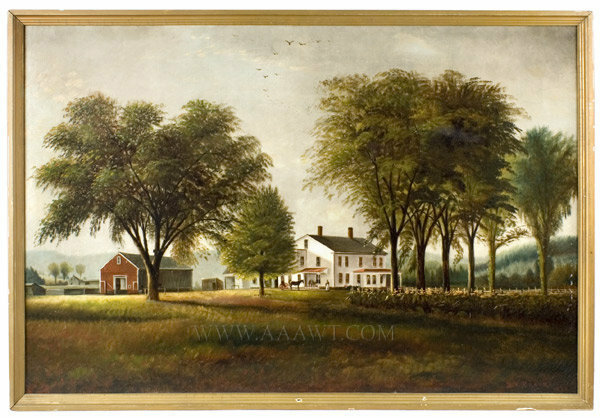 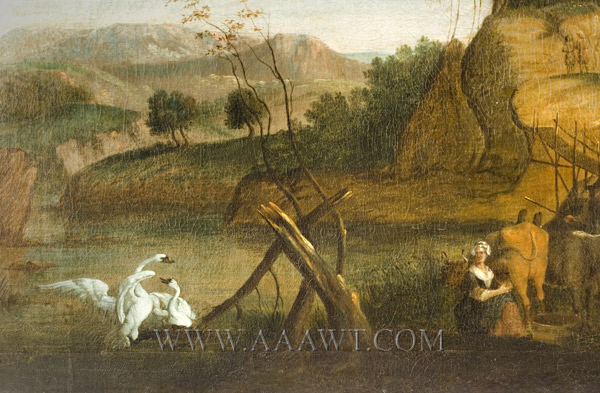 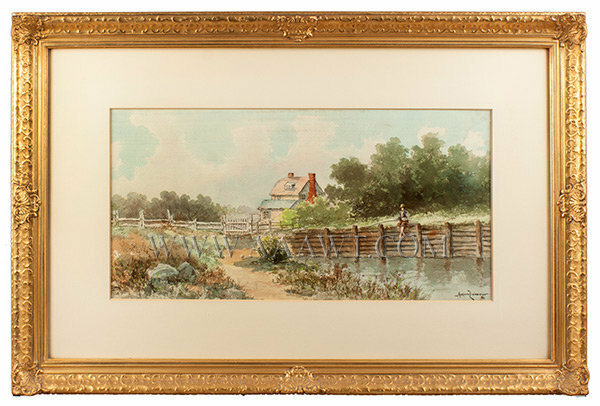 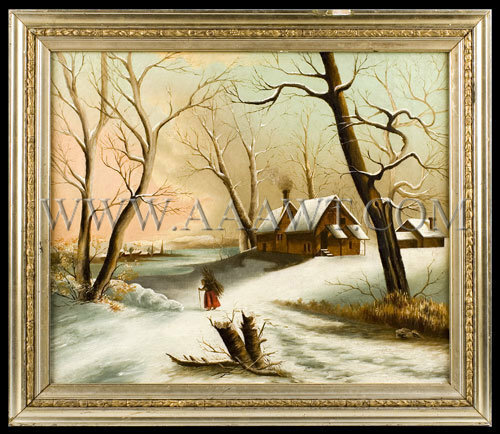 No restoration; Frame: 25.5 by 35.5"; view: 21.5 by 31.5"
A German-born painter active in New Jersey after 1849, executed this tranquil oil on canvas, depicting a (hunter?) 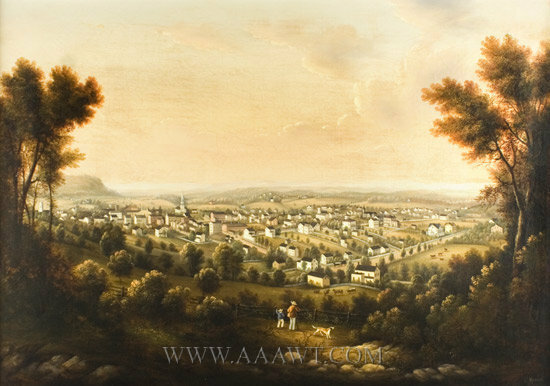 man, a boy, and a dog overlooking the view of Morristown. 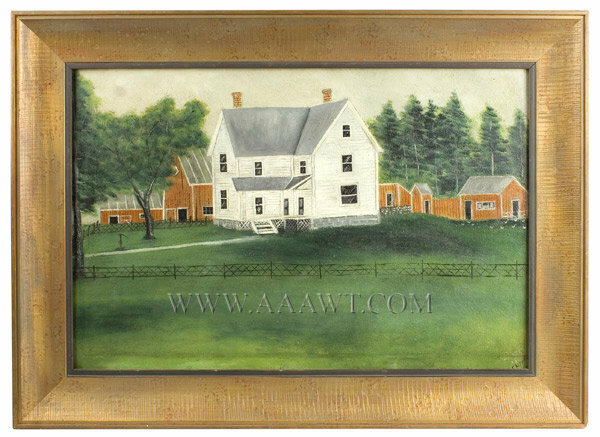 Excellent original condition, Ex Kennedy galleries. 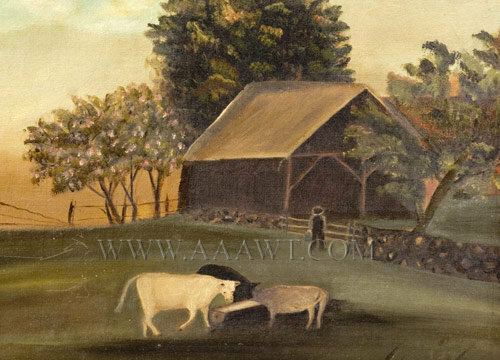 An idyllic folksy farm scene with flowering trees, cows at feeding trough; stone fence with split-rail gate, and farmer walking to post-and-beam barn. 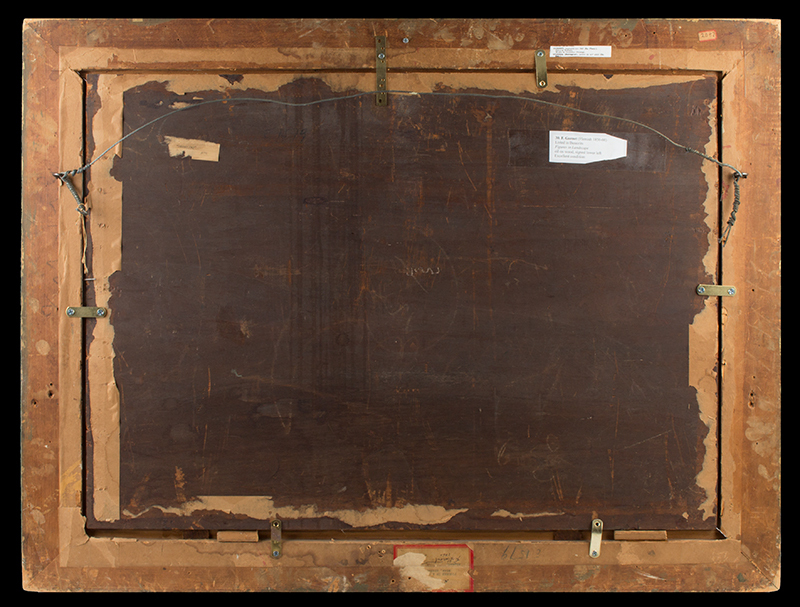 The work is stretched tightly on early stretcher and is mounted within red painted frame. 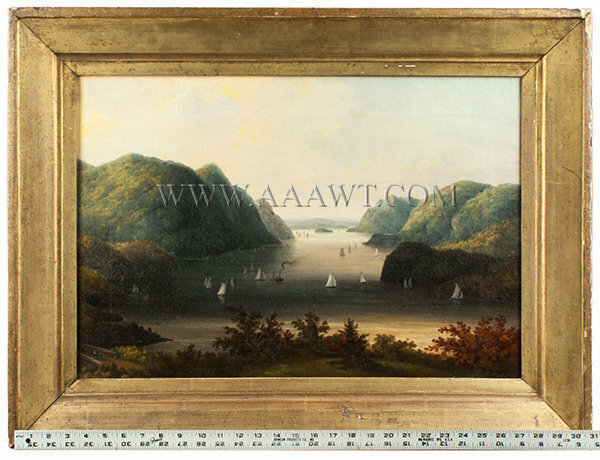 Dimensions: 16.25 by 21" frame, 12.5 by 17.25" sight-size. 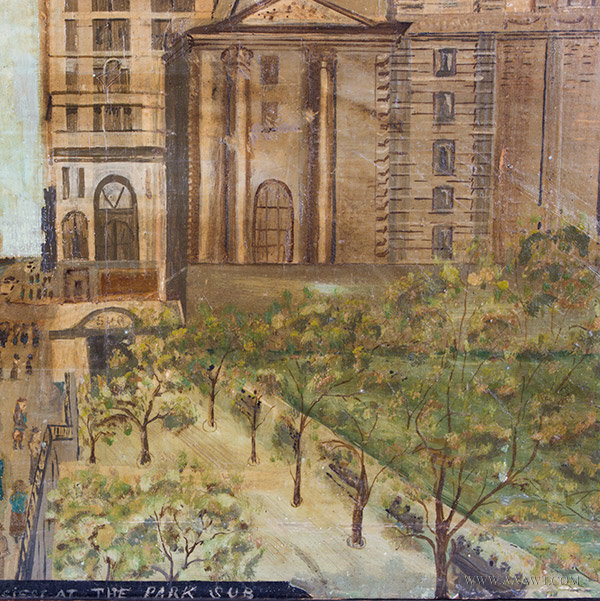 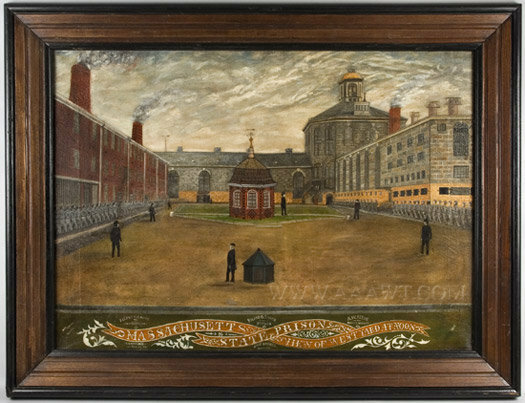 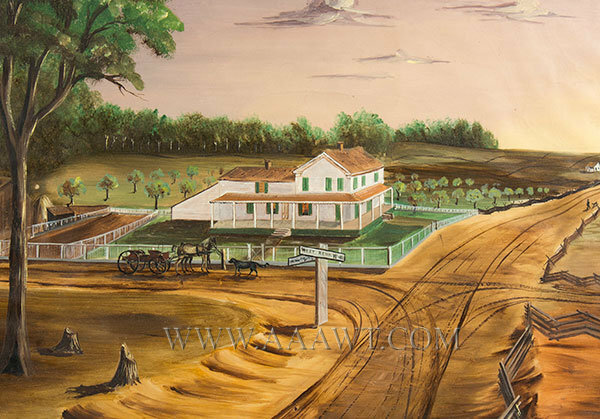 Depicted is a scene of the West Yard of the prison; painting is inscribed "Avery & Dwight Artists" and bears the title and names of prison officials within ribbon along the bottom. 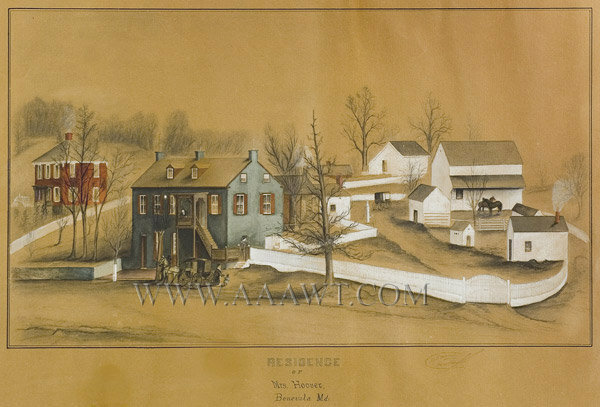 The prison, located at Lyndes' Point popularly called Charlestown prison was designed by Charles Bullfinch and was built in 1805. 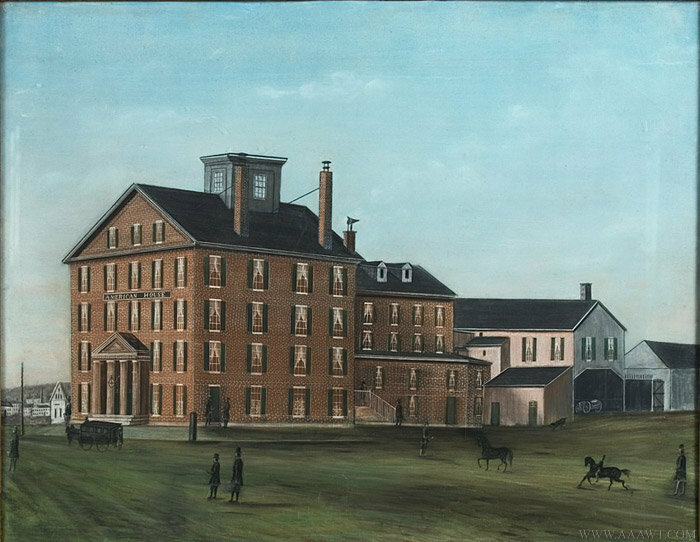 This maximum-security facility served New England for 150-years until being mostly demolished in 1955. 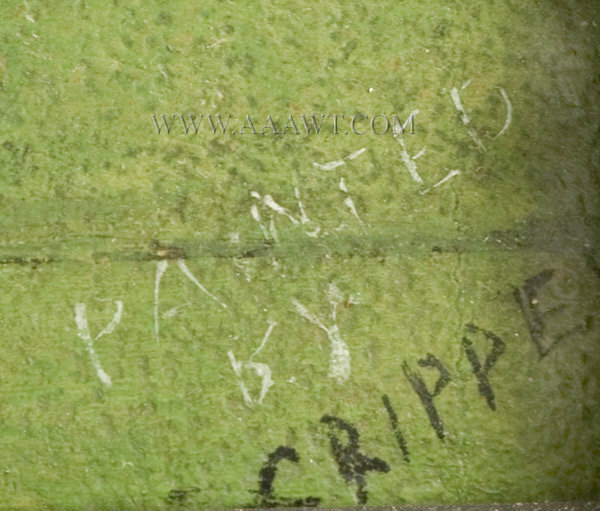 Housed within the walls were criminals, many of them very famous; paupers and debtors, and the insane. 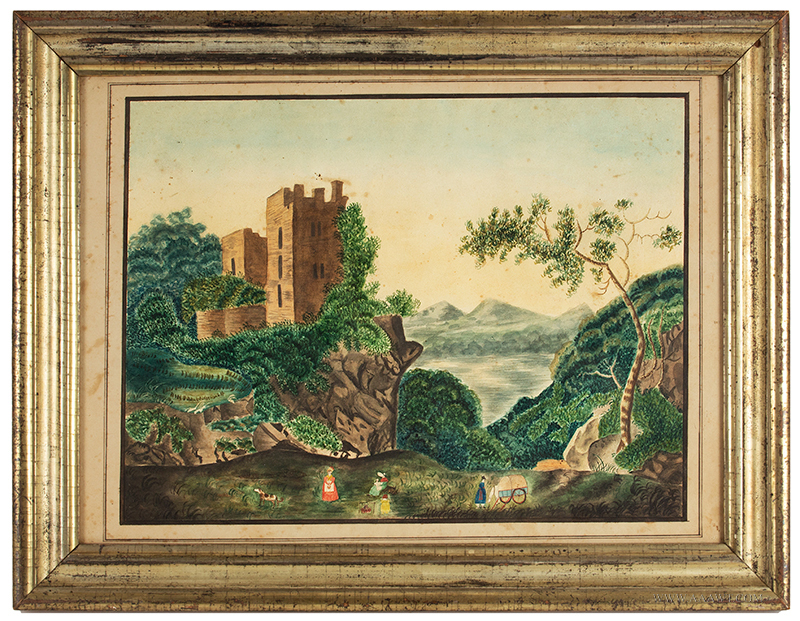 The picture depicts prisoners in neat formation with officials keeping watch. 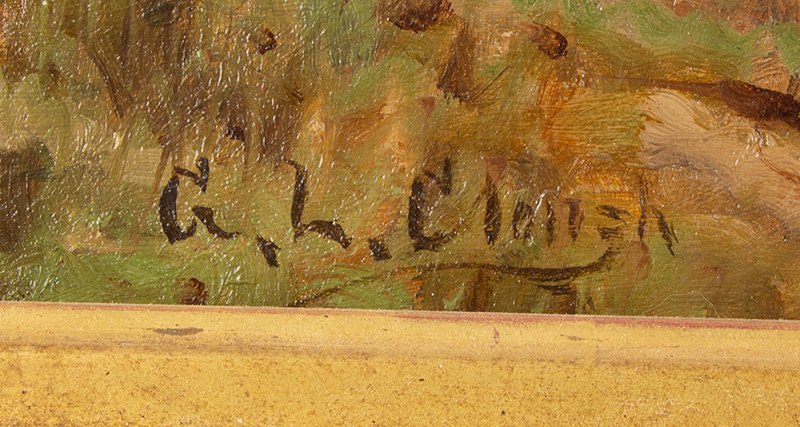 The work has been cleaned and relined; moderate in-paint. 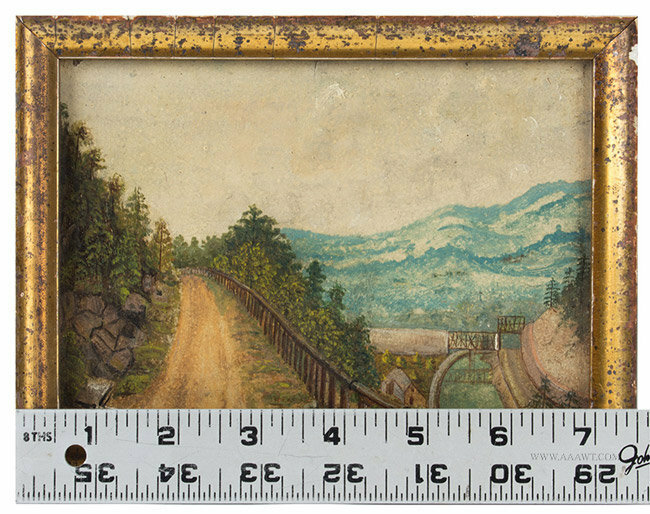 View area: 36 by 24".